Two blog posts in one day! I know you feel really lucky, kind of like when you order a nine peice chicken nugget at Mickey D's and they give you ten. 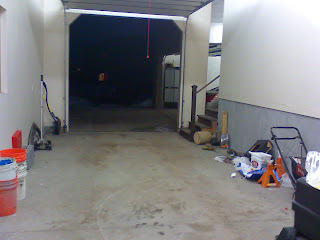 Our garage gets used and abused. There has been a couple wrecked Duramax trucks that have been rebuilt in there, two wrecked snowmobiles that were rebuilt, and two cats that left hair balls and poo everywhere. 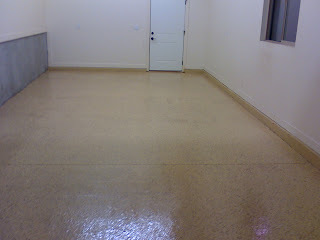 So I cleaned her out and hired my friend Ben to epoxy coat the floor. The first pic is what it was like last week, notice all the oil spots and junk littering the edges. The second pic is after I cleaned her up and Ben etched the floor with muratic acid and a grinder. The third pic is the tan, epoxy base coat cover with four different colored flakes and then a urethane coating on the top. 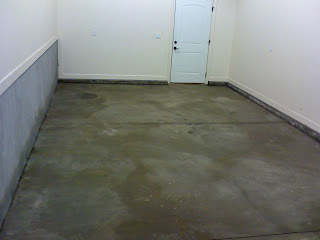 I'll be able to park in there five days after the urethane coat was applied. This stuff costs a ton, but it will make the garage so much nicer to work in. Imagine your bedroom without carpet. That's how I use to feel everytime I pulled into my garage. My truck will be so much happier. 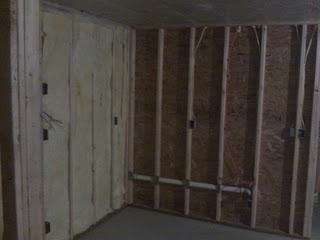 We are moving right along with the basement finish now. 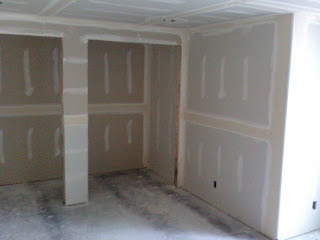 We were able to hire some Latinos to do the drywall mud and texture. It looks great and it didn't cost very much. With the current market, people are desperate for work. My money goes almost twice as far as it did a year ago. Last year I bought electrical wire for about 70 dollars a roll. You can buy that same roll for just over 30 bucks these days. My advise for the current market, buy, buy, buy! (Don't go into debt though, small note most have forgotten). I've been keeping busy over the last couple months. 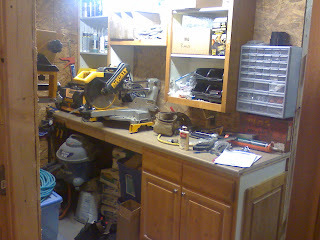 I half way finished a brick mailbox (that's how we like it in Kentucky), finished the mechanical, electrical, and plumbing in the basement, and even built a work area in my furnace room. That would be the last picture on this post. Those cabinets are high quality, straight from China, free ninty-nine cabinets. The countertop was free too. It's nice to work in construction because at the end of a job it's kind of like seeing a couch next to an apartment dumpster and throwing it in the back of your pickup (ahh, missionary memories). In construction sometimes the wrong color is ordered, the wrong size cabinet is built, or someone over ordered a product. Its either the dumpster or my house. Go ahead and ask me where that commercial weed barrier under my rock creek came from. The first pic is the insulation that was placed by other people. Yes, I finally hired someone to do something in my basement. Insulation makes me itch and I'm just not into itching. 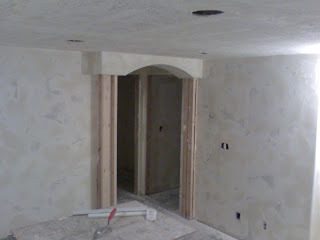 The next pic is my drywall efforts. Dan the neighbor is helping which makes it so much easier to install. 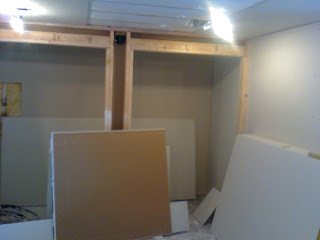 A fifteen foot, 5/8" piece of drywall weighs as much as 150 lbs! We are almost finished. Does anyone want to come over for my third drywall party?